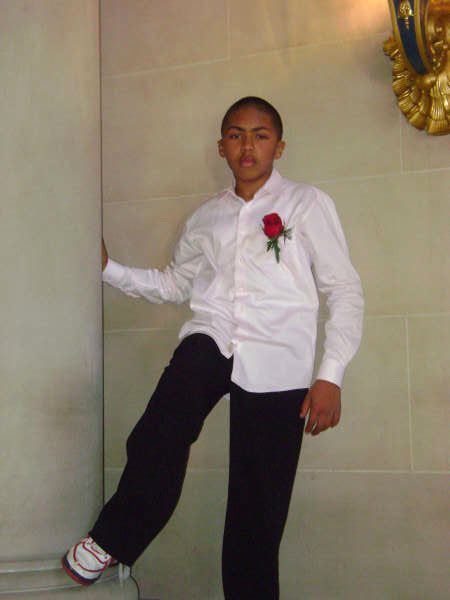 Derrick Gaines, a 15-year-old of multiracial descent, was shot and killed by Officer Joshua Cabillo of the South San Francisco Police Department on June 5, just before 9 p.m. According to police, on the night of the shooting, an officer approached two teens who they said appeared to be “acting suspiciously.” Then, the police say, one of the teens – Derrick – ran, drew a gun from his waistband and pointed it – at which point the officer gunned him down. Eyewitnesses tell a different story of events that night. They say that Derrick never drew a weapon and was instead shot down by an officer who brutalized and restrained him first – throwing him to the ground with such force that a shoe was knocked off his foot. 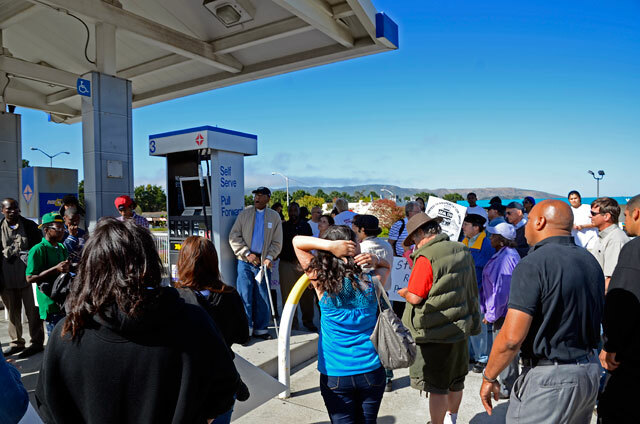 Derrick’s friends and family have staged multiple actions at the Arco gas station where the shooting happened. 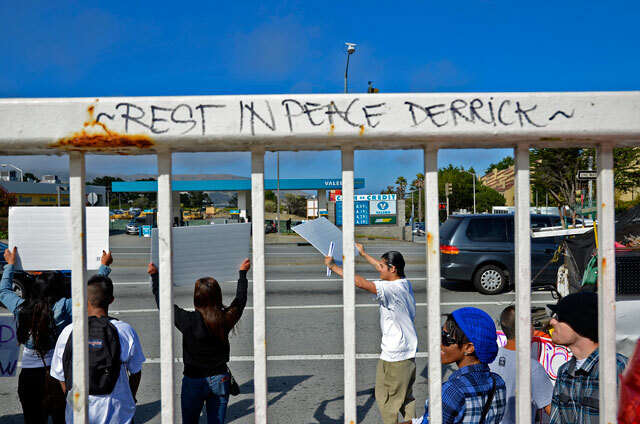 Recently, the San Mateo County District Attorney’s Office released a report that asserts Derrick’s murder was justified. Still, despite their overwhelming grief, Derrick’s mother and great aunt, Rachel Guido-Red and Dolores Piper, continue to courageously demand that the truth be heard. They spoke with Socialist Worker’s Clayton J. Plake and Sid Patel about what happened the night of Derrick’s death and their struggle for justice. 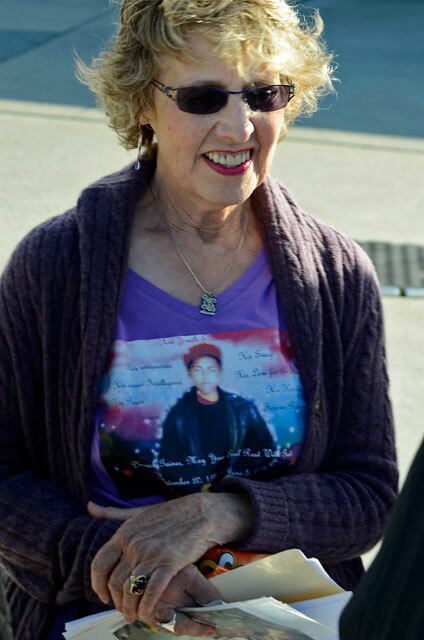 Despite their overwhelming grief, Derrick’s mother and great aunt, Rachel Guido-Red and Dolores Piper, continue to courageously demand that the truth be heard. Clayton and Sid: Could you start by telling us about Derrick and how was he known in the South San Francisco community? Dolores: He was an extremely sociable kid from the time he was an infant, and that was the way he grew up. He always wanted to be with people – with other kids, his friends, adults – and it was probably the most charming part of him. He was really not a confronter of any sort all through school, never with teachers, adults or other kids. He was even on conflict resolution panels in elementary school because that was how he was. He loved sports, both basketball and football, but he was impacted by physical disabilities that made sports tough on him. So anytime he had any dealings with law enforcement, he was never one of those kids who would be disrespectful or outrageous. His eighth grade social studies teacher wrote me a beautiful letter, and she said that she really believed that Derrick would be in some profession that would change the lives of others with his understanding of history and social justice. She said that his presence in her class elevated the level of conversation. She described him as “wise beyond his 13 years.” I’ve been carrying it [the letter] around. I actually read the entire thing at his funeral, and in it, she said that it [Derrick’s murder] was outrageous racism on the part of the South City Police Department. Clayton and Sid: What facts do you want to put out there to challenge what the South City police are saying? Rachel: That Derrick was murdered. They murdered my son. Dolores: The first thing the police department told us was that they were very involved with the kids in the local schools, that they know the South City kids really well, the ones who are struggling or what have you. And I know that isn’t true. Rachel: And his teachers. All of Derrick’s teachers. Dolores: Right. His friends, teachers, everyone – all came and said that Derrick was a good kid and would never do anything like that. He’s not the kind of kid to be threatening people with a gun, especially a cop. Clayton and Sid: That’s what the cops are saying, isn’t it – that Derrick pulled a gun? Rachel: Yeah, and now they’re saying he was a gang banger. Dolores: See, and this is my whole thing: I don’t want the community to think of him in that way. The people who knew him know he wasn’t that way. Derrick was a good kid and would never do anything like that. He’s not the kind of kid to be threatening people with a gun, especially a cop. Rachel: Regardless of what they said, the proof is in the pudding anyway. Dolores: The cops have already interviewed everybody, so they know what we know. One of the witnesses, one who saw everything, has told us that what the South City police have put out as the official story is a lie. That it absolutely didn’t happen that way. There was never any gun visible or any attempt on Derrick’s part to reach for a gun. He simply turned his back on the cop and attempted to run away. One of the things that really hurts is that Derrick died as an unknown. The cop who killed him didn’t know who he was, and he went with no name to San Francisco General Hospital. The staff at SF General had to give him a pseudonym. Derrick died unknown at the hospital. 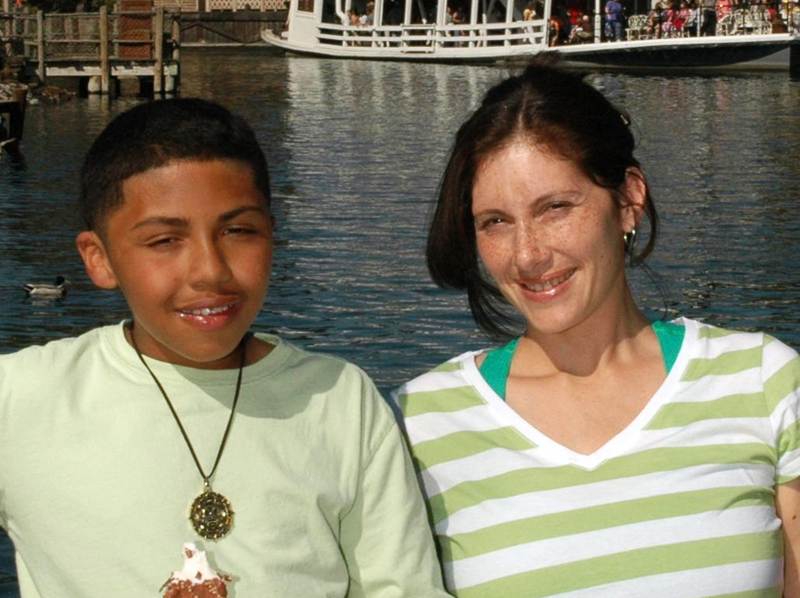 It’s so sad – this was our beloved kid. I wrote a letter of thanks to the hospital staff, who did everything they could for Derrick. Rachel: But the cops at the station knew who he was from questioning his companion. They knew who he was. They murdered him. Derrick was murdered. And they had no regard for Derrick’s life. All the way to the hospital, they just treated him like a statistic. Like he wasn’t even worth a call to his family – and they knew who he was. They never called us, never told us anything. I didn’t find anything out until I went to the station – actually the boy that was with him came to the house and told me, and then I went down to the station. See, they let the boy who was with him go right away, but another witness – they kept them there for four and a half hours, probably because they wouldn’t change their story. Clayton and Sid: For our readers who are unfamiliar with the facts surrounding the case, what happened when you went down to the police station? Rachel: I went down to the station late at night and the front was all locked up, so I started banging on the doors and finally, they sent an officer to let me in – I knew him, Officer DeSouza. He knew me personally. He knew my family. I asked him if it was my son who was killed, and he didn’t know how to answer me; he didn’t want to answer me. He couldn’t even look at me. He’s a father of two, and it must be hard for him to stand by a department that is killing our children at will. He eventually said yes, and a female officer came to the door and I got some more information. That’s how I know they knew who Derrick was. And then the officer came to the house to search it. They murdered him. Derrick was murdered. And they had no regard for Derrick’s life. Clayton and Sid: So, you went down to the police station for information about your son, and they told you they have to search your house? Did they have any kind of warrant, or give you any explanation? Rachel: No, no warrant, no explanation. And I was just in shock. But I insisted the officer who knew me be one of the people at the house when it was being searched. Dolores: Yeah. It was him and three detectives. Rachel: They searched Derrick’s room, and they searched the garage. They didn’t find anything, but they didn’t really say what they were looking for. Clayton and Sid: What was your reaction to that? How did it make you feel when they insisted they search your house? Rachel: My aunt, she’s shocked by what they did. I’ve been dealing with these people [cops] for a long time, and I know how they work, and I wasn’t shocked. And from day one, I was convinced what they were telling us was a lie. Because I drove by the scene that night not knowing that it was Derrick, and I’m going to be honest with you. When I drove by that night, it looked strange. I saw all the police officers and I saw the yellow tape and I said, “It looks like they’re trying to get their story together,” because that’s what it looked like. They were all running around, some standing in circles, one would go over here, another over there. It looked really weird. Clayton and Sid: What have your interactions been like with the police, district attorney’s office or media since then? Rachel: There isn’t any. [With the cops,] they say they don’t know, they weren’t there – when I drove by the whole department was there – and that’s it. Dolores: Well, with the DA’s office investigating, they aren’t saying anything; they can’t say anything. I kind of expected that. But they could save the taxpayers a whole lot of money if they just admitted what happened and accepted responsibility for what they did. From day one, I was convinced what they were telling us was a lie. Clayton and Sid: Do you know what’s happened to the cop who murdered Derrick? Rachel: They haven’t released his name. They put Derrick’s name out right away, and they did it without asking our permission even though he’s a minor, but they didn’t release the officer’s name. And they still haven’t. Apparently, he’s on administrative leave. I don’t know if it’s with pay or not. I’ll say this. I want to see the officer who murdered Derrick serve time. And I don’t mean what Johannes Mehserle [the officer that shot and killed Oscar Grant at an Oakland BART station in 2009] got, two years. San Mateo County doesn’t let you break any rule – they “prosecute to the fullest extent,” and they gave me two years in prison for a $150 bad check. But Mehserle gets two years somewhere else for murder. It’ll be interesting to see if San Mateo County holds the same standards for their officers, if they hold him accountable the way they go after regular people. 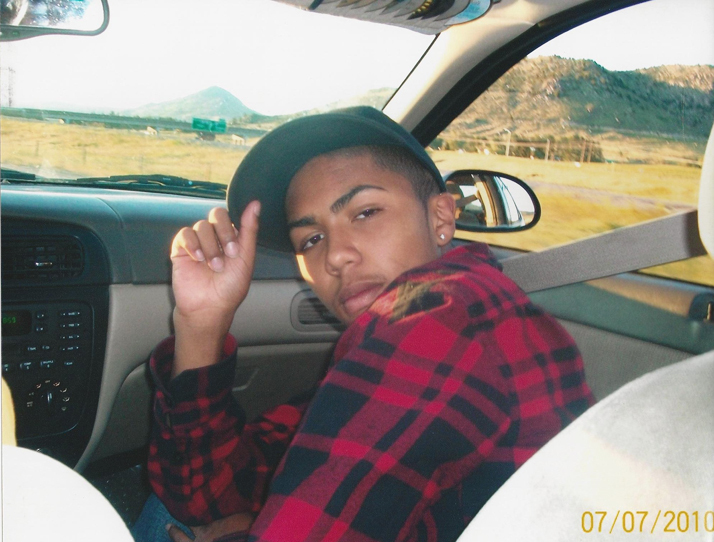 I want to see the cop who killed Derrick get 25 years to life. Not two years, 25 to life. If we get anything from the civil suit, I will use it all up to fight these guys to press criminal charges; that’s what I will do. It’s not about the civil case, I want to see the officer do time. Clayton and Sid: What are your demands now? What does justice for Derrick mean to you? What do you see as the next steps? Dolores: You know, the police have on the sides of their cars “protect and serve.” These teenagers need to be protected from the police. Rachel: Our teenagers need protection from them. Dolores: I want to see this department come out and admit they were wrong, own up to what they did – publicly – and apologize. I want them to say Derrick did not pull a gun. Are they going to squelch all the witnesses, contradict all of them? Rachel: And we want to make sure this man [the officer who shot Derrick] will not be on the streets. We want his job, and I want him behind bars. Dolores: They have to change policy. When the police set out these very aggressive policing policies, there’s going to be more of this kind of tragedy. Is there no alternative to shooting people? What about physically restraining them, or handcuffs? I want to see this department come out and admit they were wrong, own up to what they did – publicly – and apologize. I want them to say Derrick did not pull a gun. Clayton and Sid: How do you see Derrick’s case tying in to other cases in the Bay Area, like Alan Blueford, Raheim Brown and James Rivera Jr.? What do you think the prospects are for all of the families who have suffered losses like this coming together and struggling for justice? Rachel: Well, it’s hard. There’s a lot of grief and pain, and the system is just so slow. It’s a long process fighting something like this. I was talking to one man who’s been fighting for 16 years for justice for his brother. There’s just not a lot of help for the ones who are left behind. I believe it’s possible, but it’s going to take a lot of work. It’s going to take people saying: “Look, we all have something in common. We’ve all lost someone we really, truly love who didn’t deserve to die,” and take action from there. Whether it’s chaining yourself to the police station, a rally, a march to the White House, whatever it might be. And it’s going to take numbers. I believe it’s possible, but it takes a lot of work. I mean, what else can we do? I still have a little one to raise, and he’s going to see his teenage years without his brother. I want to see him grow up and not be faced with this sort of thing. Something’s got to change. 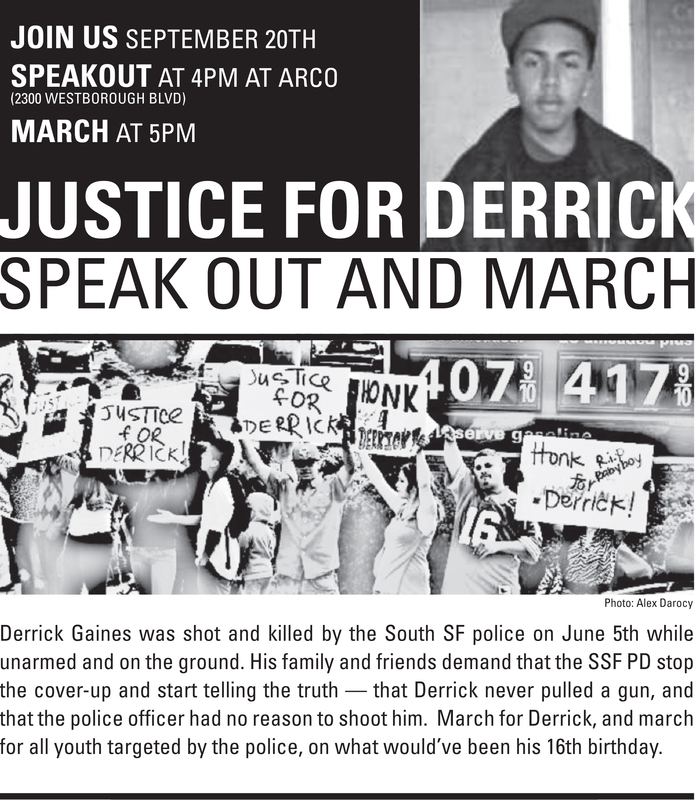 Join Derrick’s family and friends Thursday, Sept. 20, at the Arco station where he was murdered, at 2300 Westborough Blvd, South San Francisco, for a speakout at 4 p.m. and a march at 5 p.m. March for Derrick – and march for all youth targeted by police – on what would have been his 16th birthday. Clayton Plake, who can be reached at claytonplake@yahoo.com, writes for the Socialist Worker, where this story first appeared. The introduction has since been updated by the authors. But he had a gun right? No one disputes that? His friend said so. And 15 year olds never do something stupid with a gun right? I high appreciate this post. It’s hard to he good from the bad sometimes, but I think you’ve nailed it! would youmind updating your blog with more information? James Rivera Jr. was a thug, who carjacked someone with a sawedoff shotgun, and robbed them, so do no not compare him to Derrick, it is an insult! Please let me know if you’re looking for a article author for your weblog. So I am sure this website will form the well-known in the future. Products that can be used by marketing is very hard to find in many other fields. You should be able to give a lot of marketing knowledge to others. very hard to find in many other fields. You should be able to give a lot of marketing knowledge to others. I am sure this piece of writing has touched all the internet viewers, its really really fastidious piece of writing on building up new webpage. Different organisations and industries face such varying writing challenges that it is almost impossible to meet all their needs, if they are taught on the same course. According this website… This is an interesting concept that has some relevance for B2B businesses. I really like it and thanks to admin. I am usually to blogging and i really recognize your content. The article has actually peaks my interest. I’m going to bookmark your web site and maintain checking for new information. Howdy! This is my 1st comment here so I just wanted to give a quick shout out and say I genuinely enjoy reading your articles. Can you recommend any other blogs/websites/forums that cover the same subjects? Thanks a lot! San Francisco solar back on track?